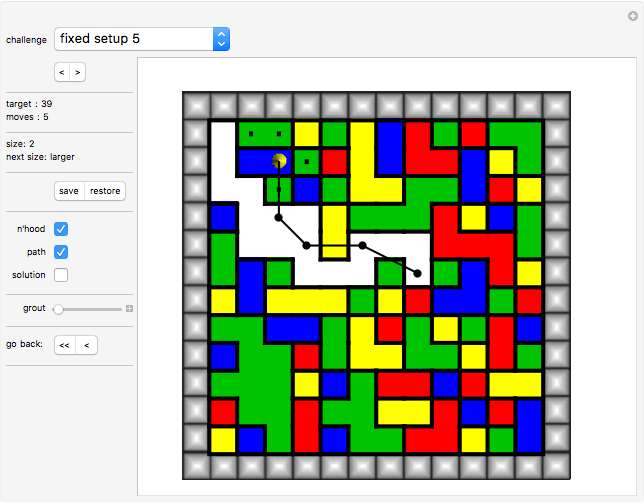 Object: Walk the area maze as long as possible, in the process eliminating as many tiles as possible. An area maze (or A-maze for short) is a maze in which one always steps onto a tile that shares an edge with the current tile and differs in area. The areas of consecutive tiles in one's path must alternately increase and decrease. 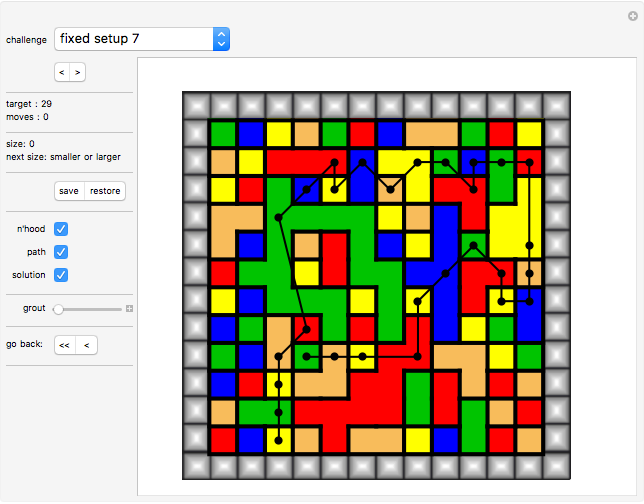 The board is filled with colored polysquares. You guide a golden token by clicking a colored tile. When you take a step, you can choose any cell in the polysquare into which you are stepping as your new location. You can step on each polysquare only once. Used tiles disappear. You win when your path has the target length (fixed variants). A move counter and the target are displayed at the left border. Variants with random setups: try to achieve a higher score (path length) than your friend. There are 10 challenges with fixed setups and two challenges with random setups. Use the "<" and ">" arrows to select the next or previous challenge with a fixed setup. Use the "<<" and "<" arrows to jump to the first or previous move. "target" The length of the longest known path is shown at the left border. Can you beat it? "size" This shows the size of the polysquare tile the token is currently on. 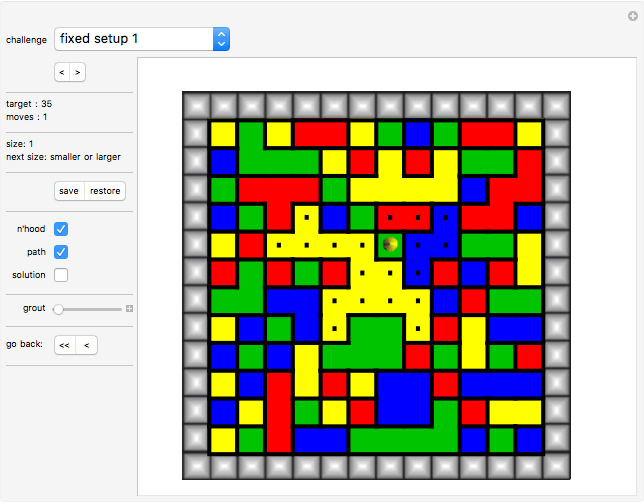 "next: smaller or larger" This shows whether your next move must land on a smaller or larger tile. Your first two clicks determine whether you start with "smaller" or "larger." "save/restore" Here you can save and restore the current board situation. "n'hood" This shows where you can place your token with your next click. It must land on a tile that is a neighbor of the previously occupied tile. "path" Click to have the system create a polyline that shows where you have gone. "solution" For the variants with fixed setup only: click to have the system show the longest path known. "grout" This allows you to choose the grout to be white or black or any gray level in between. History This game was published previously as the Zillions game "A-Maze Race" by the same author. Karl Scherer "Area Maze Race"